What do you do with your houseplants in the summertime? Do you put them outside in the shade or leave them inside? Generally, I leave my houseplants in the house year around. When you put them outside, a variety of spiders, pill bugs and other critters move into the pots for the summer and set up housekeeping. Then when you bring the plants back inside in the fall, those creepy crawlers come along for the ride. Then once inside, they leave the pots to see if there is some place better to live, in your house. 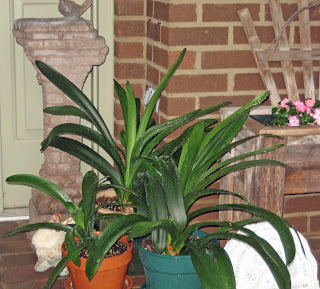 But inspite of the potential for six-legged and eight-legged houseguests this fall, I decided to put some of the houseplants, especially the Clivia plants, outside this summer. The Clivias still have a touch of mealybug and I decided that a summer outdoors would take care of that. So now you are thinking, "Carol, you are just exchanging mealybugs for pillbugs, spiders, millipedes and who knows what else? Does that make sense?" Well, it makes sense because before I bring the Clivia back inside, I plan to repot them in new pots, so the likelihood of hitchhikers will be minimized. Hopefully. I also set out the amaryllis and poinsettias, and will make an attempt to get them all to rebloom for Christmas. 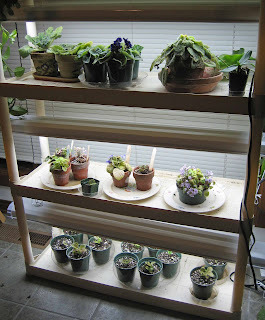 All the other houseplants will stay inside, including the African Violets. Awhile back I proclaimed something about how African Violets are "your grandmother's houseplant" and you should have no more than one African Violet for every decade of your age. 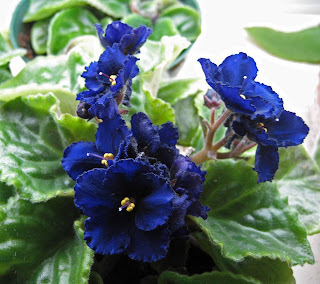 Since then, I divided a couple of my African Violets, rooted another dozen from leaf cuttings, and went to an African Violet show and accidently bought some more African Violets. So now I am 230 "African Violet years old". With all the time spent on the outdoor garden in the spring and summer, many people neglect their houseplants, at a time when they actually need more attention. Here's some tips on caring for houseplants in the summer, based on my experience. - Houseplants grow more in spring and summer, just like other plants, and so need more water and fertilizer now than they need in the fall and winter. - If you do repot any houseplants, make sure the containers have drainage holes. Without them you are likely to overwater the plants and kill them. - Houseplants can be summered outside but keep them in the shade. They aren't used to that bright sunlight and can actually get burned by the sun. - Be sure to 'de-louse' houseplants in the fall before bringing them back inside and put them back inside well before the first frost. When you repot your houseplants, many can be divided up to give you all kinds of new plants. If you find you have too many of any of your houseplants due to "overpropagation", freely give them to friends and family and maybe you'll be responsible for getting someone else interested in plants. I need to find a few of my own family members and friends who would like an African Violet or two or three. I've got to bring my "African Violet age" back down to some reasonable number! My houseplants stay inside all year...it gets much too hot and dry here to torture them by taking them out. Once in a while I'll take them outside to flush the mineral buildup out...but they come in the same day and stay out of the sun the whole time. I am guilty of neglecting my houseplants at this time of year! I did move one of the streptocarpus outside and the hummingbird came immediately to visit. It has magenta flowers. I am considering leaving many inside this year. I spend quite a bit of time cleaning them to bring them back inside and that is something I hope to avoid. I imagine you could find a "soon to be wed" neice who would like some house plants for her new home. 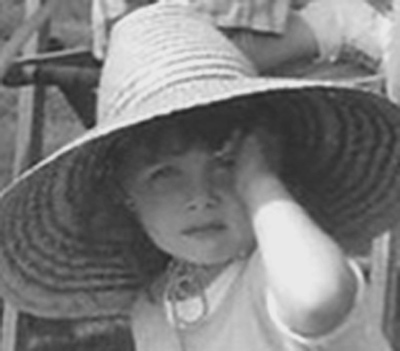 After all, her favorite aunt did give her some gardening tools that she needs to use. I currently have only one houseplant. I used to have more, but as I started traveling, they had a tendency to die. Now all that is left is my trusty aloe plant in the kitchen and I would never put it outside. It needs to be in the kitchen for when I burn myself. There are plants that are for the inside of the house???? Seriously, I used to have a whole bunch of houseplants before I went to college; they were left behind at Mom & Dad's. (I think Mom killed them) I don't currently have any houseplants but Mom does. I guess she figured out what she was doing wrong! Hello from Carol in Nora - Just wanted to tell you that I have the same Henri fountain as you! I have taken some great photos of "real" birds perched opposite the stone bird sharing a nice drink of fresh water! My 'real' houseplants could die in the heat outside but are not exactly flourishing inside now...they get less light in summer when we keep blinds at least partially closed against the sun. The jade plants get morning sun so are okay. Plants like Thanksgiving cactus and Meyer's Lemon only come in for a few months here and some plants that are houseplants in the North, like aspidistra and some ferns, can live outside all year. I don't have any African violets, Carol - if I let you have my share will that be like trading carbon emission credits? If you are 230 years old in African Violet years, does that make me an infant since I have none?? I am sorry to say I only have 1 houseplant at the moment. I used to have quite a few, but they suffered from my neglect. My green thumb, if I have one, works only outside now. this is easy for me...I have no houseplants! No houseplants Carol...can't keep them and keep the cat! my houseplants stay inside all year, but I do have a clivia I ought to haul out. I have two false jasmines that are OUT-side plants that I keep inside in the winter, then put them out when it is warm enough! I haven't split up my violets in a while, it does tend to increase out of control. My poor houseplants were set out way too early. It will take them all summer to recover no doubt. I just douse the pots with an insecticide right before I bring them in. Not a great way to do it but that is my method. I put all the most delicate houseplants out for the summer. It's much less work to hose them all down instead of water each individually and I find they thrive in the humidity and rain water. Down here the lizards are what comes in with the plants in the fall instead of bugs. It's interesting that you should write about putting houseplants outside for the summer. I've been thinking about that. I love having the house full of plants and know I would miss them if they were outside. I'm up to 28 plants at this point including a hand full of cuttings I need to give away. Besides, I also grow houseplants for their air cleaning qualities so they wouldn't do much good if they were outside. I put all my houseplants outside for the summer. They love it. When I bring my peace lilies back in I have to whack them back severely or I would have no room in the living room at all. The only one I don't take outside is my flame violet, which is SO happy where it is I am reluctant to move it for fear of making it unhappy. 230 years old in african violet years!! that made me laugh out loud. Thank you! I live in Usa-city in the south in Japan. Some of the plant that you are growing can be seen also in my garden.please see my Garden.